NDSU student Calvin Benson watches the results come at the Fargo Holiday Inn. 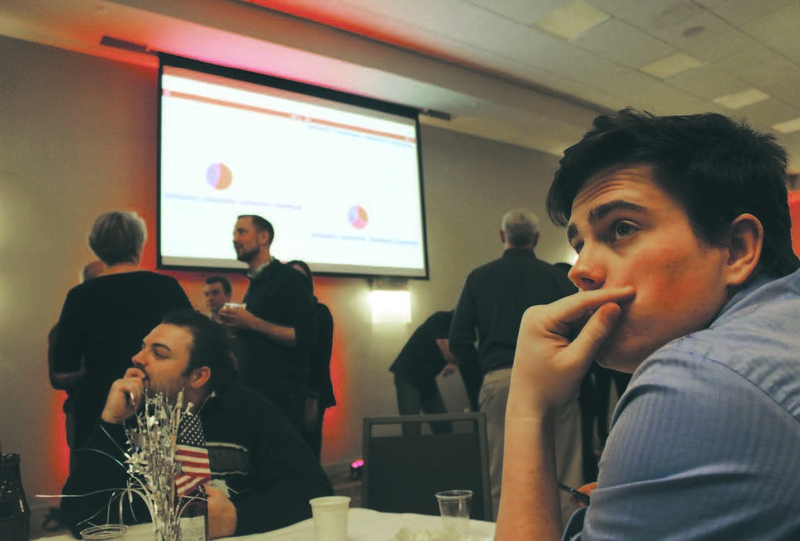 In quintessential North Dakotan fashion, Republicans braced the freshly fallen snow to watch their red state get even redder at the Republican watch party in Fargo Tuesday night. Calvin Benson, a senior at North Dakota State, and Raheem Williams, an economist and North Dakota Young Republican policy advisor who lectured at NDSU, were supposed to watch Kevin Cramer give his acceptance speech in Bismarck, but were held up by the weather. The results were not surprising to either of them. “I’ve gotten to know candidates (on) both sides of the aisle, and I’ve seen the energy from both sides of the aisle, and tonight’s results all across North Dakota were entirely expected,” Benson said. Williams said some politicians in the state have fallen out of line with North Dakotan voters and need to do some soul searching. North Dakota hasn’t sent three Republicans to Washington D.C. since 1965, and these young Republicans can smell the possibilities. Benson said these wins mean better policies for North Dakota in areas such as energy, agriculture, trade deals and international agreements. Williams said he sees that North Dakota’s young Republicans have a lot to do with this election. “We’re getting younger, and one thing that this victory shows is that conservatism transcends generations,” Willaims said. “NDSU is constantly touted as one of the most Republican schools in the country,” Benson said. Polling and results from the Fargodome precinct show just how red the university is, according to Benson. The post Fargo Celebrating North Dakota’s Red Wave appeared first on The Spectrum.